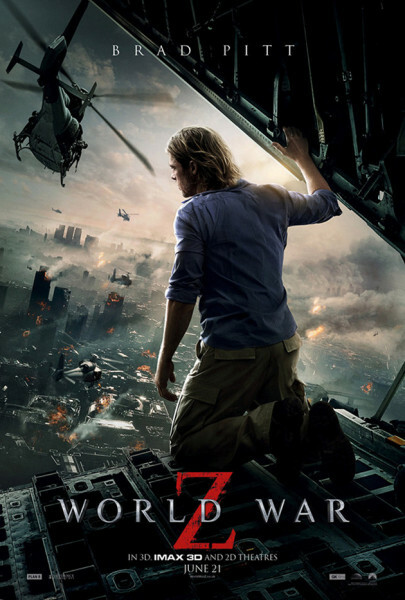 “World War Z (2013)” movie review. Plot: A United Nations Employee (Brad Pitt) traverses the world, trying to find the cure for a Zombie Pandemic which continues to grow rapidly. When “World War Z” went into production, I clasped my heart and promptly died from bliss. There were so many things that made the whole project seem appealing. It was based on a much lauded novel (with the same name), which for some reason, I have yet to read. But everyone tells me that it’s creative and unique, two words that have long since been forgotten in the realm of zombie films. Furthermore, this would be a lavish production- from the cast to the spectacle- which has become a rarity for the genre. The cherry on top was the presence of Brad Pitt as the protagonist. I wouldn’t call Pitt a great actor, but he generally is reliable when it comes to choosing projects. Everything about “World War Z” seemed amazing…until it started filming. To say that the production became turbulent is a bit of an understatement…Pretty much, everything that could go wrong behind the scenes went wrong. The budget bloated, egos went rampant and re-writes were demanded. It was unsettling to learn that $170,000,000 dollars had been put into 71 minutes of useable footage, but us zombie fans were dismayed to learn that there would be a PG-13 rating. As time went along, they eventually finished the movie, but our despair only grew as we learned about the changes. “World War Z” no longer seemed like an exciting prospect. Instead, it just looked oddly safe, catering to a younger crowd and being overly familiar, looking like every zombie movie except with more CGI. The only ray of sunshine to be found was that it was receiving some ‘decent’ notices from the critics, whose opinions I tend to discount when dealing with horror films. Now that I’ve seen it, I’m still not entirely sure how I’m supposed to feel. It’s entertaining, with flashes of brilliance. But I also think it could’ve been more. Maybe by reviewing it, I can fully sort out my own feelings. This is the part where I discuss what will polarize many viewers. “World War Z” was forced to go through a lot of changes and they ended up focusing more on the action than on its ideas. For many viewers, the end result is a dumbing down of what could’ve been a thought provoking story. On the other hand, many have pointed out that the books narrative wouldn’t have translated very well into film, so emphasizing the action was the practical choice. As for me, well… you can see a much smarter movie hiding behind what ultimately is a popcorn flick. It teases us with something ‘more’ than just a zombie movie, without ever going any further. Maybe a better way to phrase this is there are hints that “World War Z” is intelligent. But it’s not obvious at the first glance. Personally, I actually think I liked this. Why? Because “World War Z” isn’t just entertaining. It also has some clever and inspired ideas, like how the protagonist uses his observational skills to combat the zombies. Why don’t I see more films have characters use padding to protect themselves from zombie bites? How many zombie movies have we seen where a character gets bitten, but refuses to do anything about it until they turn and kill their friends? Or how many times have we seen someone get bitten, and a friend/loved one refuses to put them down? 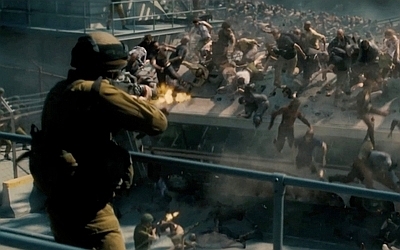 “World War Z” doesn’t just avoid these very problematic cliches, it flat out defies them. I liked how “World War Z” uses its flashes of brilliance as an added flavor to the overall product, instead of aiming to be high-art. Had it been more cerebral, it may have been a little boring. But once again, you have to consider what you wanted from it. Maybe you wished for a film that stimulated the intellect instead of catering to the lowest common denominator? Maybe you would’ve preferred a bloodbath? “World War Z” is not something along the lines of “Man of Steel“. It’s more akin to “Fast and the Furious 6“, except the script happens to be smarter. Does that make any sense? Now that I’ve put my thoughts onto paper, I can firmly state that I liked “World War Z“. Is the ending a bit of a letdown? Sure, but it didn’t sink the movie (for me). Will many hate it? Yes. Zombie enthusiasts will be annoyed by the lack of gore, although at least “World War Z” does its best to move around that. Everything moves so fast that there wouldn’t be enough time to linger on the violence without breaking up the pace or being unnecessarily gratuitous. Many might’ve expected a great movie, instead of just getting a typical summer blockbuster. The flashes of genius might only serve that frustration, as you can see a much better film on the editing room floor. Yet I was able to accept it as popcorn entertainment. Whenever it exceeded that, it was merely extra levels of butter…because I do love my popcorn to be covered in butter…mmmmm….The big problem is that even though this was a positive experience (for me), “World War Z” probably will never be able to overcome its controversial production. For it to be a financial success, it has to become the highest grossing zombie movie of all time. It has to surpass “Zombieland“, which didn’t even gross what “World War Z” cost. It was good, but not good enough to where we will forget the behind-the-scenes drama anytime soon. Violence: PG-13. Not bad, but it’s PG-13. Overall: I thought “World War Z” was fun. But the real question is why, and whether or not you’ll agree with me.